Although Ethernet LAN technology continues to evolve, the limitations of the twisted pair, copperbased wiring at the heart of the standard are causing some enterprises to look at alternative options for their next-generation LAN infrastructures. Provide a premium service experience. A POL delivers gigabit speeds and protects sensitive data with built-in, military-grade security features. 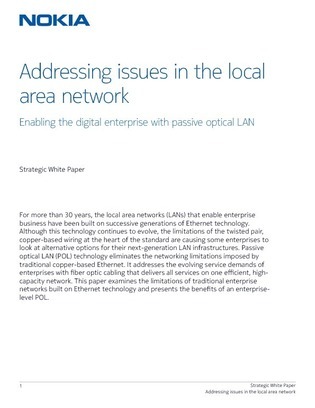 Reduce costs by delivering all services on one efficient, high-capacity network. Download this white paper to learn more, and see how your organization can benefit from the technology.